grevillea : Grevillea "Pink Lady"
You can return to our grevillea page or browse the pictures using the next and previous links. New purchase whilst down in Cornwall this week. It is Yorkshire - now to find out how hardy they are!! Good find, not seen this before lovely flower. Milky - it was your pictures that bought these to my attention! How do you care for yours? from what i've seen of it Meanie it's relatively Hardy and drought tolerant. a gem of a plant that is.. I think that it'll go into my raised bed that's getting a winter roof Surreylad. they have a raised bed with a roof at the edinburgh botanical gardens. Mine will be nowhere near as grand as theirs Sticki! doesnt matter so long as it works!! im not into grand things ~ prefer practical!! Me neither, although I would prefer that it didn't look like a dogs dinner! well ~ very true. got to look at very least fit for purpose. This photo is of species grevillea juniperina. 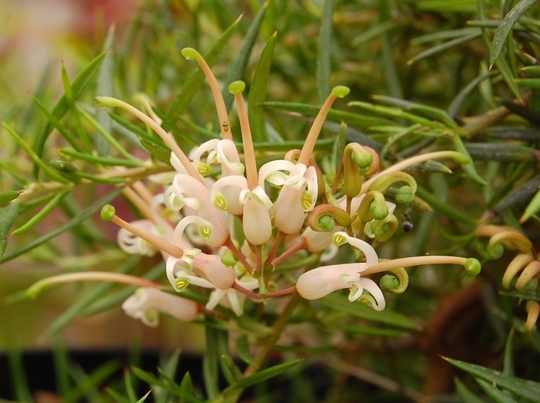 See who else has plants in genus Grevillea.